Joel was the son of Bethuel, of the tribe of Reuben. He lived in the 9th century B.C. and prophesied when the King of the tribe of Judah was Joash. 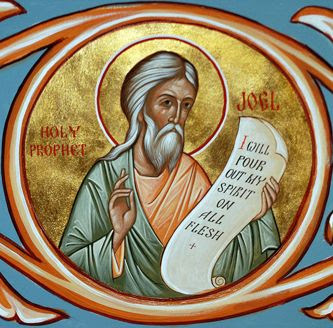 Joel belongs to the category of the so-called twelve lesser Prophets. His prophetic book is small, consisting of only four chapters, but it is classified as most poetic, ornate and a jewel of Hebrew literature. He preached repentance to the people and their return to the God of their Fathers, saying to them: "'Even now,' declares the Lord, 'return to Me with all your heart, with fasting and weeping and mourning.' Rend your heart and not your garments. Return to the Lord your God, for He is gracious and compassionate, slow to anger and abounding in love, and He relents from sending calamity" (Joel 2:12, 13). He did not fail, however, to voice the gratitude of God for the repentance of the people, as long as it became a reality, as well as His promise to always be with and protect His people: "Then will the Lord be jealous for His land, and pity His people... 'And ye shall know that I am in the midst of Israel, and that I am the Lord your God, and none else; and My people shall never be ashamed'" (Joel 2:18, 27). He prophesied the coming of the Holy Spirit to the Apostles on the day of Pentecost, which is why he is known as the Prophet of Pentecost: "And it shall come to pass afterward, that I will pour out My spirit upon all flesh; and your sons and your daughters shall prophesy, your old men shall dream dreams, your young men shall see visions. And also upon the servants and upon the handmaids in those days will I pour out My spirit" (Joel 2:28-30). Furthermore, he prophesied the Incarnation of Christ, the Son and Word of God, as well as His Second Coming. First, many of the prophecies of the Old Testament which refer to the Economy of God for the salvation of man, namely the Incarnation of the Word of God, the miracles that He did, His voluntary Passion, His Resurrection and Ascension, and Pentecost - that is, events which took place many centuries after their announcement - are puzzling and difficult to understand. For this reason it is necessary to study the texts of the Holy Fathers, who were God-seers and therefore infallible interpreters of Holy Scripture, as well as the hymnological texts of the Church, which contain, in meter, the whole theology of the Church, since the sacred hymnographers are theologians - God-seers. In the second chapter of the book of the Prophet Joel, written among other things is the following: "And I will show wonders in the heavens and in the earth, blood, and fire, and pillars of smoke" (Joel 2:30). According to the interpretation of the Holy Fathers, the Prophet refers to the Incarnation of the Second Person of the Holy Trinity, the Son and Word of God, "who for us men and for our salvation" allowed Himself to be incarnated "by the Holy Spirit and the Virgin Mary". The sacred hymnographer gives this interpretation with wonderful poetic words, in the "Doxastikon" which is chanted in the Holy Churches on the first Sunday after the Nativity of Christ, where he writes: "Blood, and fire, and pillar of smoke, wonders on earth were foreseen by Joel; the blood of the Incarnation, the fire of Divinity, the pillar of smoke is the Holy Spirit, Who by the Virgin created the flesh of the Word, bringing fragrance to the world..." That is, the blood indicates the Incarnation of Christ and the fire reveals His Divinity. This means that Christ is Perfect God and Perfect Man. The pillar of smoke indicates the Holy Spirit, through Whom came about the Incarnation of God the Word, in accordance with the word of the Archangel Gabriel to the Theotokos: "The Spirit of the Lord will come upon you, and the Power of the Most High will overshadow you; for the holy one born will be called the Son of God." Therefore, when one studies the Holy Bible, one must not attempt to interpret it by himself, through one's reflection, like the Protestants do, because there lurks the danger of delusion. He should consult the patristic teachings and the hymnology of the Church, the study of which will not only provide insights, but nourishes and supports spiritually, as well as arms the spiritual organism with strong spiritual antibodies. Second, after the coming of the Holy Spirit to the Apostles on the day of Pentecost, the Apostles preached to the people the word of the Lord. The audience consisted of people belonging to different races, with different dialects. That is, they were "Parthians and Medes and Elamites, and the inhabitants of Mesopotamia, Cappadocia, Judah, Pontus and Asia, Phrygia, Pamphylia, Egypt and parts of Libya to Kyrinin ... Romans, Jews and proselytes, Cretans and Arabs", and yet all could hear and understand the word in each ones language. Of course, this does not mean the Apostles, who were Galileans, preached at the same time in various languages, but they preached in one, even their own language. The hearers, however, heard the word in their own language and this is how they understood. This, of course, was done by the Grace of the Holy Spirit. And this paradoxical event, that is, for some people to speak various languages and by the Grace of God to be able to communicate, did not only happen then, on the day of Pentecost, but continued in the life of many saints, ancient and modern. And there are several examples. In contrast, among impassioned people understanding is difficult if not impossible, even if everyone uses the same language. The person who has an inner purity and in whom works the energy of the Holy Spirit, is an inexhaustible source of fragrance, blessing, peace, and comfort for all those who come in contact with them, when, of course, the people are in a position to smell, feel and understand. Source: Ekklesiastiki Paremvasi, "Προφήτης Ιωήλ", September 2012. Translated by John Sanidopoulos.